Emily Hauger is the Resident Assistant Stage Manager for this season and will be Stage Manager for The Who and The What. The same actors. The same set. The same costumes. The same script. But not necessarily the same show. Over the last two and a half months, I’ve had the unique opportunity to work on The Glass Menagerie in three different venues, two different states, and two different companies. As you have likely heard, The Glass Menagerie is a co-production between Gulfshore Playhouse and Weston Playhouse Theatre Company in Weston, Vermont. We rehearsed and performed in Weston in August and September, and then we briefly rehearsed and are performing again here in Naples. As the Assistant Stage Manager, I had the pleasure of watching the process of putting together this show from the beginning. I saw the hard work in the rehearsal room, the many changes during tech, and the blossoming of the show once it was in front of an audience. In most cases, that would be where it ends. We find a rhythm with audiences, but we do not really have a chance to discuss how the show lived and breathed with an audience in the room. During this co-production, however, we had the incredible opportunity to rehearse again. I watched as Kristen Coury and the four actors took what we learned in Weston and worked it into the show. What got a laugh? What got a response? Where did we feel like the proverbial ball got dropped? These questions and many more were asked, answered and worked into the show. This is the same show as in Weston, but it is different. It has grown. It has evolved. It has been informed by you as audience members. And, it will continue to grow during the next few weeks. To me, that is a large part of the magic of theatre. Yes, the goal is to keep the show the same each evening, but it will never be exactly the same. In a movie, lines and props and blocking and anything else you see will never change. In a play, even the slightest change in the inflection of a line may make a scene play much differently than the evening before. An unexpected reaction from the audience might make us question why that moment had a connection with someone. It is through those differences that we – both onstage and in the house – may learn something we never realized before. So, I invite you to come experience The Glass Menagerie. Not only is it different for us, but it may be different for you too. You may have only seen it once or you may have seen it 100 times, but given the chance, this – and every play – has the unique ability to affect you in a different way each time you see it. 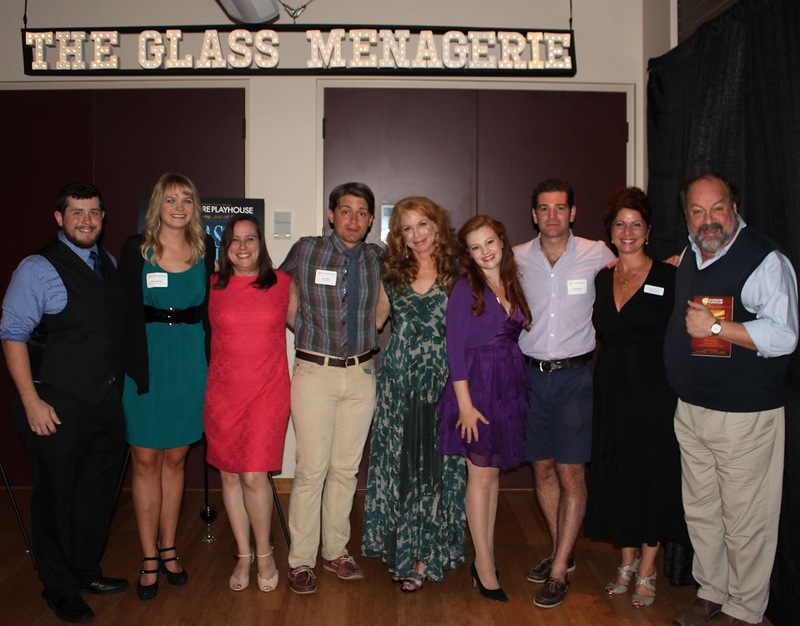 The cast and creative team of The Glass Menagerie from both Vermont and Naples. John Forton (Assistant Technical Director), Emily Hauger (Assistant Stage Manager), Emily Wells (Stage Manager – Naples Run), Eric Gilde (Tom), Amy Van Nostrand (Amanda), Andrea Lynn Green (Laura), Ben Jacoby (Jim), Kristen Coury (Director), Steve Stettler (Artistic Director of the Weston Playhouse Theatre Company in Weston Vermont).